Our study showed that disharmonies of the Lung, Heart, Spleen and Bladder meridians are most common in women with non-malignant lumps in their breasts. Our results seem to be at odd with the “established” idea that breast health is mainly affected by the disharmonies in the Stomach, Liver and Kidney meridians. The phenomenon of “belt block” which is very evident in women with cancerous breast is not readily evident in women having benign lumps in their breasts. Declaration of Interest: CA Care records its sincere thanks to Dr. Adrian Larsen, President of Miridia Technology Inc., USA, for his generosity in donating a unit of AcuGraph 4 for our research at CA Care. We receive no financial incentive whatsoever from Miridia Technology for writing this article. Consultation and acugraphing at CA Care are provided to cancer patients free of charge. In our earlier article, Meridian Disharmony Patterns in Breast Cancer Patients, we noted three distinct meridian disharmony patterns among women with breast cancer. Disharmony pattern one shows a belt block with energy concentrating in the upper half of body. In disharmony pattern two, there was no belt block and the energy was concentrated around the centre of body. Disharmony pattern three shows a belt block with energy concentrating in the lower half of body. Given these results, we found it hard to relate what we have seen to the established theories often quoted in TCM (Traditional Chinese Medicine) books and websites. We have not given up trying to “understand” and “verify” these established theories! One fact is evident. The disharmony patterns we observed earlier were of women who had breast cancers and they had already undergone medical treatments. Perhaps these meridian disharmonies represented a far more advanced stage of the disease and the problems compounded by their treatments. 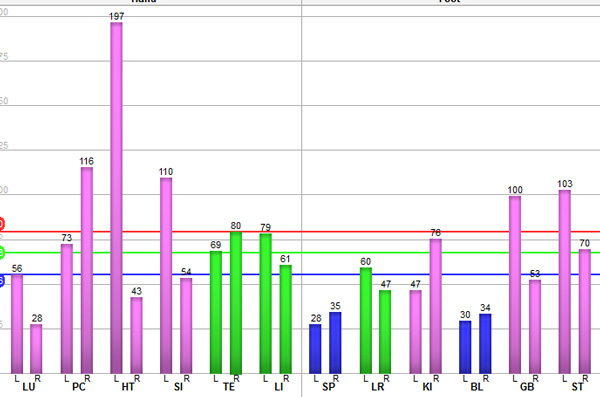 So, we have decided to study the meridian disharmonies of patients who only have non-malignant lumps. These women have “abnormality” in their breasts, but have not undergone any medical treatment. What can we learn from their acugraphs? In 1617, Chen Shigong wrote that breast cancer results from anxiety, emotional depression and over-thinking. These impair the Liver, Spleen and Heart causing obstruction to their meridians (1). Zu Dan Xi of the Yuan Dynasty wrote that “worry, anger and depression cause accumulation. Spleen Qi is weakened, Liver Qi free flow fails, there is a hidden nodule formed like an egg without pain or itching; after several years it forms an ulcer and it is called Ru Yan. It looks like an ulcer on the surface and is like a stone in a cavity, it cannot be treated “(2). Mathematical permutation (i.e., 6 X5X4X3X2X1 = 720) tells us that these six variables can give rise to 720 different types of qi stagnation in the breast (3). That indeed appears intimidating and very complex. Nevertheless, remember that Einstein faced a far more complex problem than this and he came out with a simple and well known equation, E = mc2 ! More than 50 percent of breast cancers are diagnosed in the area of the breast associated with the Stomach meridian. Twelve percent of breast cancers appear in area associated with the Liver meridian. Twelve percent of breast cancers appear in area associated with the Kidney meridian. The remaining 26 percent of breasts cancers appear in area associated with Lung, Pericardium and Spleen meridians. From the above it appears that three major meridians – Liver, Stomach and Kidney – are important for maintaining breast health. “If you can keep Qi flowing through these meridians, you are far along the path toward real prevention of breast cancer. Close to 70 percent of cancer is diagnosed where these meridians run. These three meridians are part of the organ systems: Liver/Gallbladder, Stomach/Spleen and Kidney/Bladder (5). Patients who came to seek our therapy were required to bring their medical reports. 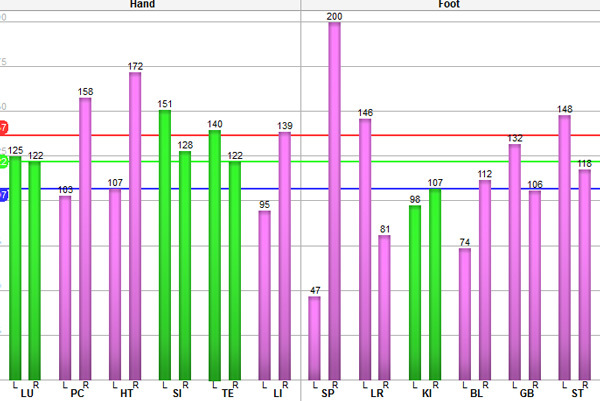 We used the Jing-well points to evaluate their meridians with AcuGraph 4.0. 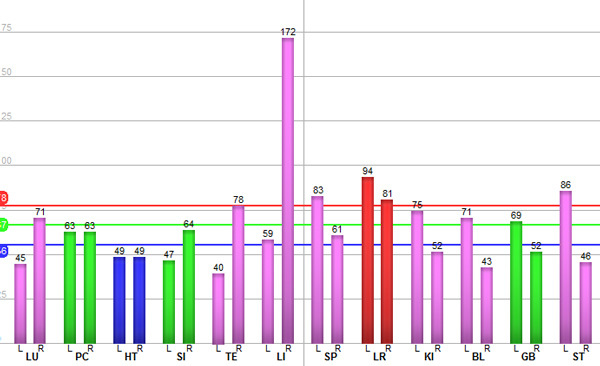 At the time of acugraphing, patients have not undergone any medical treatment. Patient 1 is 34 years old. USG in 2003 showed bilateral breast cysts with wall calcification. The cyst in the right breast was 19.4 x 9.6 x 19.8 mm while in the left breast was 15.7 x 11.0 x 14.5 mm. These cysts were removed in 2005. 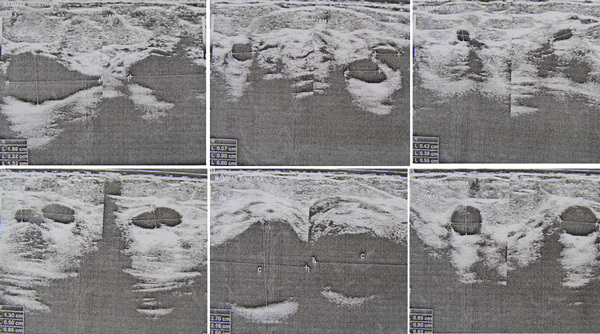 USG in 2009 showed a right breast cyst measuring 2.7 x 3.0 x 3.9 mm. Patient 2 is 32 years old. USG indicated a well defined 13 x 12 x 10 mm fibroadenoma in her right breast. Patient 3 is 51 years old. In 1970 three cysts were removed from both her breasts. In 1980 five cysts were removed from both her breasts. In 2008 four cysts were removed from her breasts. 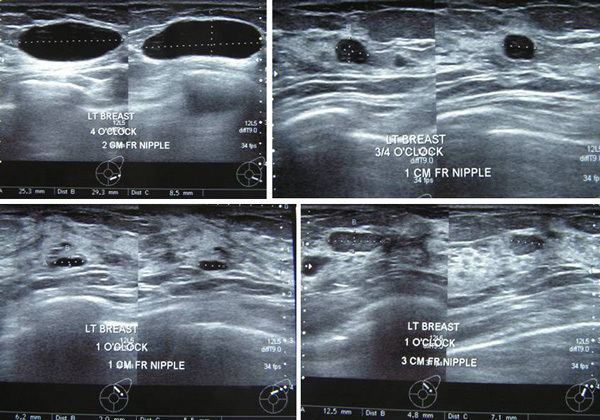 USG in 2010 indicated bilateral solid nodules – 12 in the right breast and five in the left breast. Patient 4 is 41 years old. There are cysts scattered in both breasts ranging from 2 to 29 mm. Her left breast has 13 x 5x 7 mm and 5 x 4 x 8 mm fibroadenomas. Patient 5 is 32 years old. She had pains at the breast lumps during her menses. 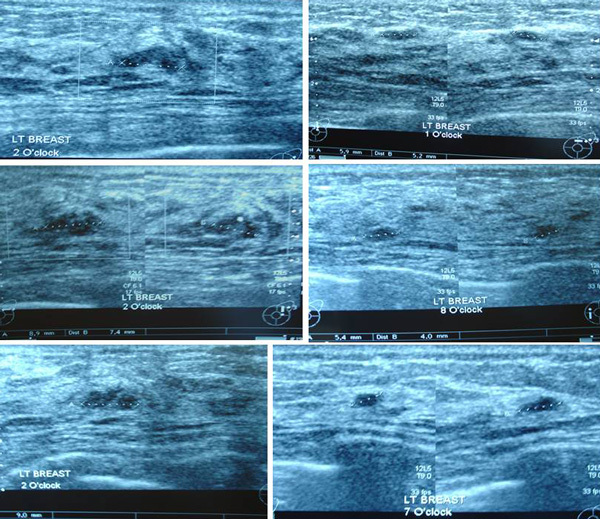 Bilateral biopsies indicated features of fibroadenomatas. Patient 6 is 48 years old. 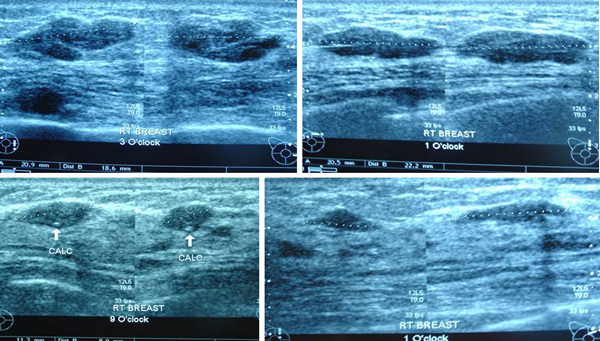 Bilateral mammograms showed multiple oval densities scattered in both breasts. They ranged from 5 to 10 mm. They have smooth outlines with no calcification within. Patient 7 is 34 years old. 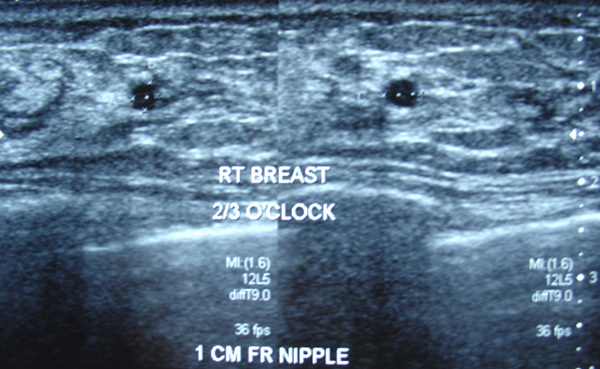 An USG indicated multiple cysts in both breasts. The doctor told her there were about twenty cysts in each of her breast. Patient 8 is 47 years old. 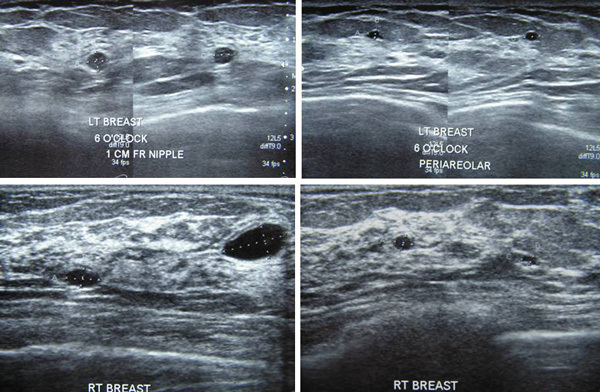 USG indicated an irregular solid nodule in the left breast, 7.3 x 6.1 x 10.4 mm. 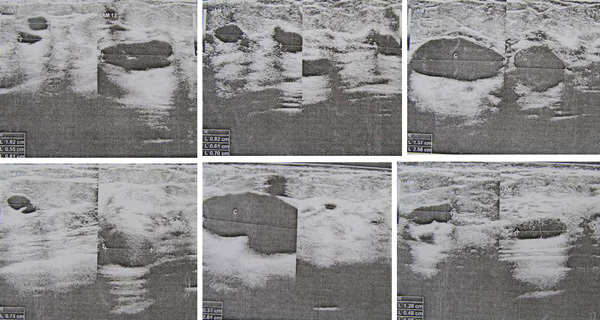 Two other lumps in the left breast were probably fibroadenomas, 4 x 3.1 x 4.4 mm and 2 x 1.8 x 2.5 mm). 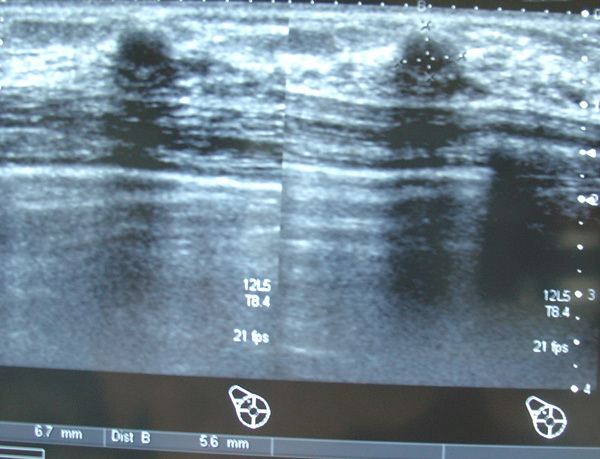 Right breast with two fibroademonas, 4.5 x 2.9 and 4.6 x 8.1 x 7.7 mm. Patient 9 is 34 years old. 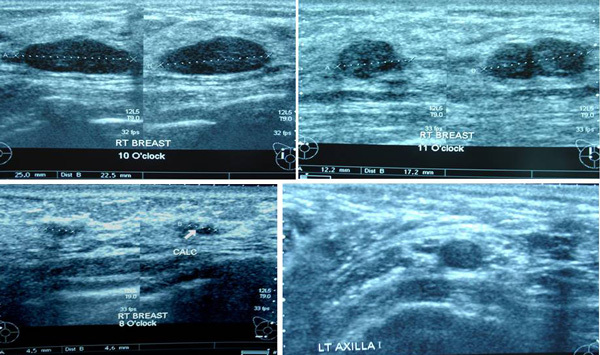 USG indicated an ill defined 28 x 24 x 19 mm right breast lump, suspicious of carcinoma of the right breast. However, an FNAC confirmed that it was not malignant – a fibroadenoma. 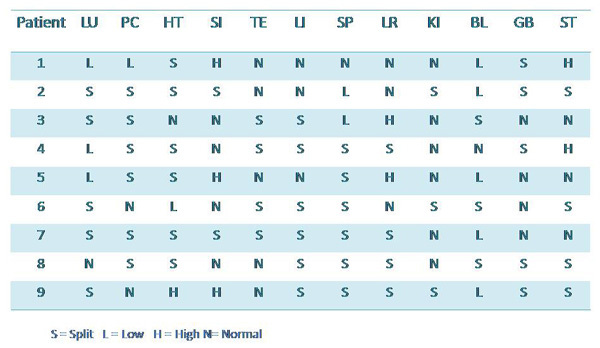 For ease of comparison and study, the AcuGraph results of the 9 women are summarized in the two tables below. Table 1. 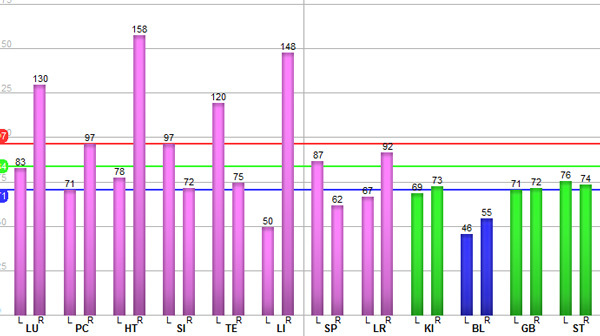 Measurements of the twelve meridians in 9 women with non-malignant breast lumps using AcuGraph 4. Table 2. A summary of disharmonies in the twelve meridians of 9 women with non-malignant breast lumps. Eighty-eight percent of women showed Lung meridian disharmony – either Split or Low. Eighty-eight percent of women showed Heart meridian disharmony – mostly Split with 1 High and 1 Low. Eighty-eight percent of women showed Spleen meridian disharmony – all Split and 2 Low. Eighty-eight percent of women showed Bladder meridian disharmony – 3 Split and 5 Low. Seventy-seven percent of women showed Pericardium meridian disharmony – all Split and 1 Low. Sixty-six percent of women showed Large Intestine meridian disharmony – all Split. Sixty-six percent of women showed Liver meridian disharmony – 4 Split and 2 High. Sixty-six percent of women showed Stomach meridian disharmony – 4 Split and 2 High. Fifty-five percent of women showed Gallbladder meridian disharmony – all split. Forty-four percent of women showed Small Intestine meridian disharmony – 2 Split and 2 High. Forty-four percent of women showed Triple Energizer meridian disharmony – all Split. Thirty-three percent of women showed Kidney meridian disharmony – all Split. The phenomenon of “belt block” which is very evident in women with cancerous breast is not readily evident in women having benign lumps in their breasts. Our study showed that disharmonies of the Lung, Heart, Spleen and Bladder meridians are most common in women with non-malignant lumps in their breasts. 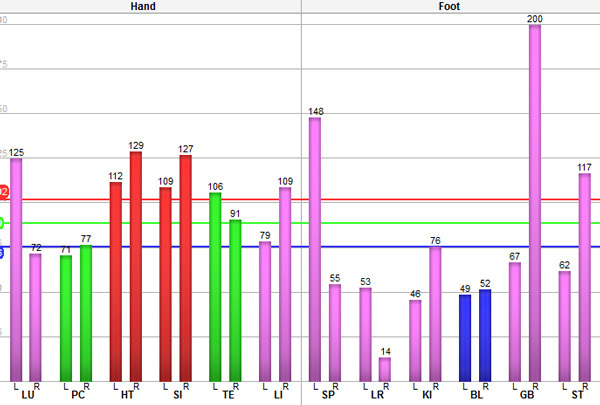 Meridian disharmonies of the Liver, Stomach and Kidney ranked 3ath, 3bth and 6th in frequency, respectively. In our earlier article on women with malignant breast tumours, we found out that the most common disharmonies in this group of women are the Bladder, Lung, Small Intestine, Triple Energizer, Spleen and Liver meridians. Putting our two studies together, our data show that meridian disharmonies of the Lung, Bladder and Spleen play significant roles in women’s breasts. Most women with either malignant or benign lumps in their breasts show disharmonies in at least these three meridians. Our results seem to be at odd with the “established” idea that breast health is mainly affected by the disharmonies in the Stomach, Liver and Kidney meridians. Even if we were to look from another perspective – the Liver, Stomach and Kidney being part of the organ systems: Liver/Gallbladder, Stomach/Spleen and Kidney/Bladder – the results would not put Stomach or Liver meridian disharmonies as being the most frequent occurrence in these women. The “dark horse” is the Lung meridian disharmony. It is not our intention to “challenge” established ideas, but rather to point out that with the availability of modern devices such as the AcuGraph, there is now an opportunity for alternative practitioners to reexamine and reevaluate some of the entrenched ideas that have been handed down to us ages ago. Rather than being too generalized, can we be more precise and definitive? Dare we ask, Are these “age-old established theories” supported by present-day data which we can “see”, evaluate and analyze? Shi Lanling & Shi Peiquan. 1989. Experience of treating cancers with Traditional Chinese Mediicine. Shandong Science and Technology Press, China. Giovanni Maciocia. 1998. Obstetrics and Gynecology in Chinese Medicine. Churchill Livingstone, New York. Nan Lu, A Woman’s Guide to Healing from Breast Cancer. 1990. Avons Books, New York.